Joel Eastwood is a born and raised “Maritimer” being born in Liverpool, NS and raised in Saint John, NB. He placed His faith in Jesus Christ for salvation at an early age through the testimony of godly parents and faithful preachers and teachers of the gospel. 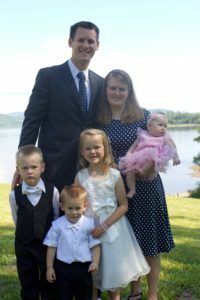 He felt the call of God to full time service as a young boy and pursued his training at Emmanuel Baptist Bible Institute, graduating with a diploma of Bible and Ministry in the spring of ’09. He then went on to complete his Master of Arts in Theological Studies from Calvary Baptist Theological Seminary in the spring of 2011 and is currently pursuing his Master of Divinity degree from Maranatha Baptist Seminary. He was privileged to pastor for 6 years at Bethany Independent Baptist Church in Little Lepreau, NB before accepting the call to come to Moncton to serve at Emmanuel Baptist Church as Administrator of EBBI and Assistant Pastor and now Senior Pastor. He is blessed to serve alongside of his precious wife Tara along with their 4 young children. His passion is to preach the good news of Jesus Christ and see people’s lives changed as they place their faith in Jesus and walk with Him. He looks forward to meeting you in person!